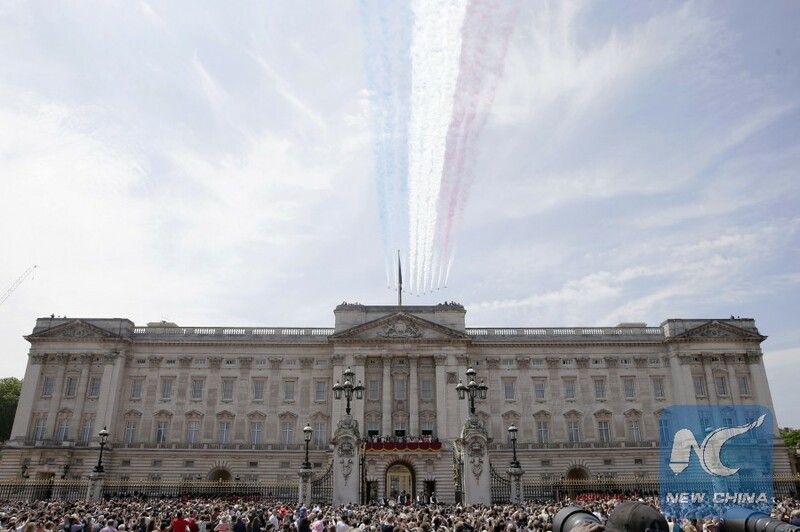 LONDON, June 30 (Xinhua) -- Queen Elizabeth's main London home, Buckingham Palace, is undergoing a multi-million dollar refurbishment to minimize the risk of a catastrophic fire, an official report into the money paid for the British monarchy has revealed. More taxpayers' money has also been given to the Queen and the Royal family to reflect that for the first time since Queen Victoria there are now three generations of working Royals at the same time. Queen Elizabeth, who is 92, her sons and grandchildren are now on Royal duties, something not seen since the 1800s. More than 3,000 engagements were carried out by members of the Royal family in the past year. The figures do not show how much the latest addition to the Royal family, American actress Meghan Markle, who is now the Duchess of Sussex, is costing taxpayers. The report reveals that the taxpayer-funded costs paid to the Queen are 13 percent higher, with the cost of work at Buckingham Palace accounting for a large slice of the extra. Sir Michael Stevens, whose job title is Keeper of the Privy Purse, said the program addresses the urgent need to overhaul Buckingham Palace's essential services, some of which have not been updated since the 1950s. "These important works will help avert the very real danger of a catastrophic building failure such as a flood or fire," said Stevens. He said during the first year the oldest and highest-risk electrical cabling has been removed. Stevens said the palace also commissioned a 3D survey of the building which has given an unprecedented level of detail about the building, one of the most photographed landmarks in the British capital. In 1992 Queen Elizabeth watched in horror as a fire broke out in her other London residence, Windsor Castle. Her second eldest son said the Queen had been devastated by the extent of the fire which caused massive damage. The official accounts published on Friday show the public funds used by the Queen for official expenditure and duties went up in the past year from 55 million U.S. dollars to 62 million U.S. dollars. Queen Elizabeth's official expenditure is met from public funds, but millions of dollars are paid back in exchange based on income generated by the vast Crown Estate which owns large areas of land, as well as commercial buildings and houses. Stevens added: "For the first time since the reign of Queen Victoria, there are three generations of the royal family at work together in support of The Queen. Each generation brings its own style and personality."